Spoilers for The Flash and Supergirl included. 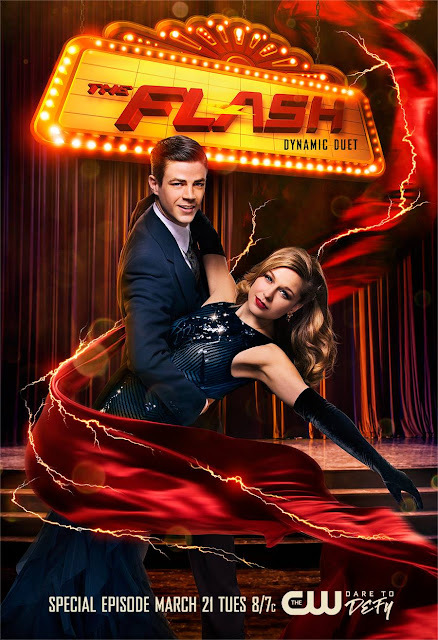 When the Music Meister sends Barry and Kara into a musical world, they have to follow the script and sing to escape. Meanwhile, J'onn, Mon-El, and Cisco team up to track down the Music Meister and free their friends. Can I say I liked every aspect of this episode? Because not only was it fun, it was fantastic. The music, the time period, the characters, even the reason the Music Meister sent them there--all of it was great. This is by far one of the best (if not the best) episodes of The Flash yet! The songs for this episode were good. Kara and Barry's solo songs were decent, but their duet was so fun and adorable. I love that these two are "Super Friends." The "dad" song between Joe, Stein, and Merlyn was freaking hilarious, but they also all did a fantastic job. (Seriously, go listen to these guys. John Barrowman's voice is marvelous.) Winn's song was pure magic; he is seriously so good. I'm not at all surprised, but it was so much better than I expected. *sniffles* Even Cisco sang, which was cute. I love the plot of both the episode as a whole and the "musical" world. Joe and Stein being mob partners and partner-partners was hilarious and unexpected. Merlyn being a mob boss and the owner of the speakeasy was perfect, and having Mon-El as his "son" Tommy was too much. (I mean, honestly, did they have to call him Tommy?!) But the greatest was that Mon-El and Iris' "characters" in the musical were in love. I laughed a lot when Barry and Kara discovered them! The whole thing with the mob bosses, the speakeasy performances, and the time period clothes was fun. Kara was absolutely gorgeous in those outfits; I'm insanely jealous. This episode had it all. Team Flash working alongside J'onn and Mon-El to save Kara and Barry was perfect. I'm glad they interlaced the musical world with what was happening on Earth-1. It was fun to see them team up and interact. (We need more small crossovers between these shows, I swear.) Plus, Cisco and Caitlin learning J'onn is a Green Martian was perfect. The reason the Music Meister sprang Kara and Barry into the musical world was to teach them a lesson, and I like how they did it. It wasn't too cheesy (I mean, it was as cheesy as a musical episode of a superhero show can be), and I liked how they referenced a lot of musicals during the story as well. It was touching to see Barry and Kara stand up for the "characters" and learn something about their own recent choices and decisions regarding love. Okay, but I'm actually happy that Barry proposed again and that Iris said yes. There is no way you'd say no to Barry after he just sang an entire song to you, but it also felt right. It wasn't forced or for the wrong reasons. It was out of love. The only thing I didn't like is that not every character sang. I guess that probably goes back to not every actor/actress can sing, but I had been hoping they would have Caitlin or Iris or Wally (or Mon-El) sing something, even a short piece like Cisco. Plus, it wasn't that musical-esque. Sure, there were songs, but most weren't spontaneous, walking-down-the-street, out of nowhere kind of songs. Most were staged (similar to High School Musical) where the characters are supposed to be singing anyways. While it didn't take away from the episode as a whole, I had been hoping for more songs and more performances by the characters I adore. In addition, they kind of dropped the Supergirl cast from the episode once they returned from the musical world. I guess we'll find out what happened between Kara and Mon-El on the next Supergirl episode, but they didn't even say goodbye. Oh, well. Also, where was Julian? He just didn't even show up. Sad face. I thought this episode was fun and a nice break from the major plot lines of both The Flash and Supergirl. It was cute that the Music Meister was played by Darren Criss, who was on Glee with both Grant Gustin and Melissa Benoist. And since the Music Meister was acting with "good" intentions and didn't die, they could always bring him back. I'd be very interested in another musical crossover, but this time they should bring in Oliver Queen so he can stand in the back with his arms crossed, glaring as everybody sings. It would be perfect. Overall, they did a great job. What did you think of "Duet"?